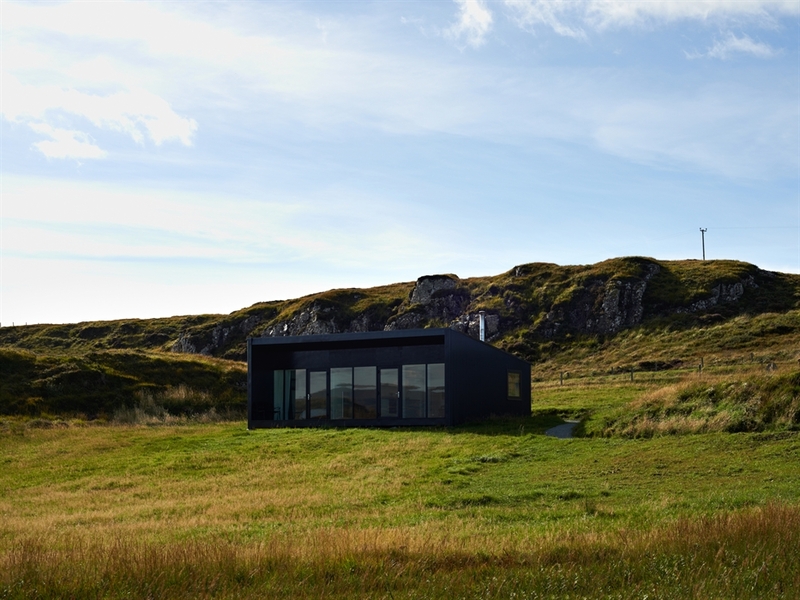 Inspired by traditional shepherd accommodation and designed by local awarding winning architects, An Airigh provides a high level of comfort and takes full advantage of the stunning views. Full height double glazing across the front of the building brings you closer to the amazing views and landscape – perfect for a relaxing week’s holiday or romantic getaway for two. An Airigh has one bedroom with luxury king size bed, duvets and sheets are all made of natural materials. A large full height built-in wardrobe for all your clothes and shoes. 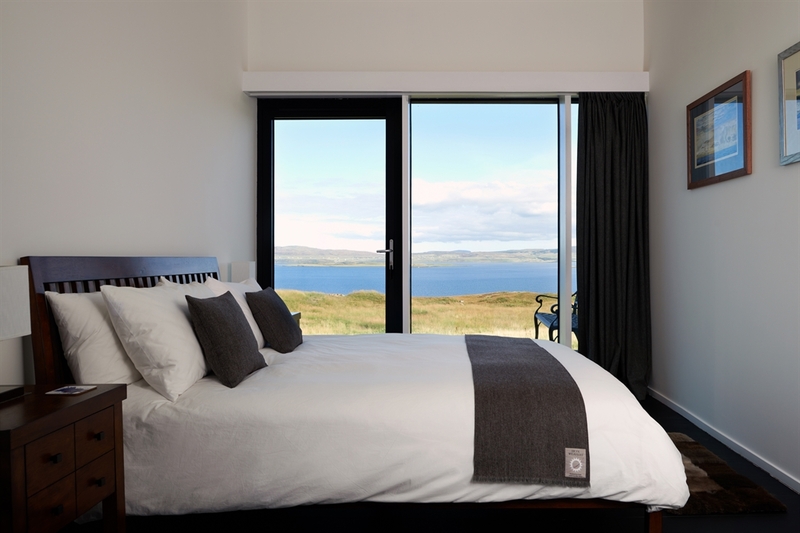 Full width room windows with views to the Dunvegan Loch and the Western Isles. Underfloor heated oak wooden flooring. Lovely locally made herringbone tweed curtains and cushions. Door to step out on beautiful mornings to the terrace. 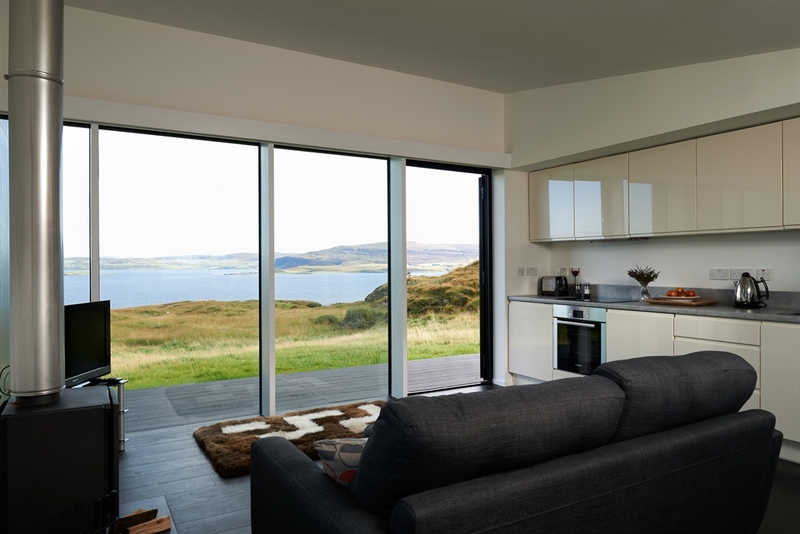 The living area has full width picture windows with views to Loch Dunvegan and the Western Isles. 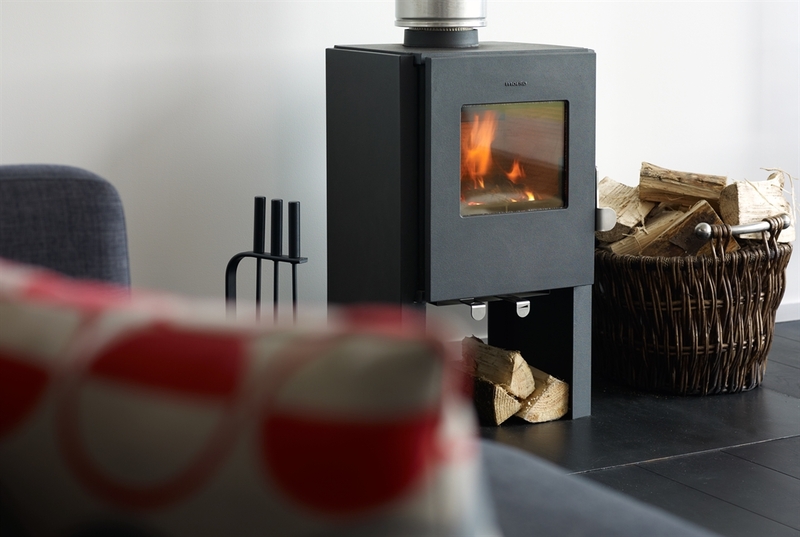 Modern wood burning stove to enjoy cosy evenings (logs provided). 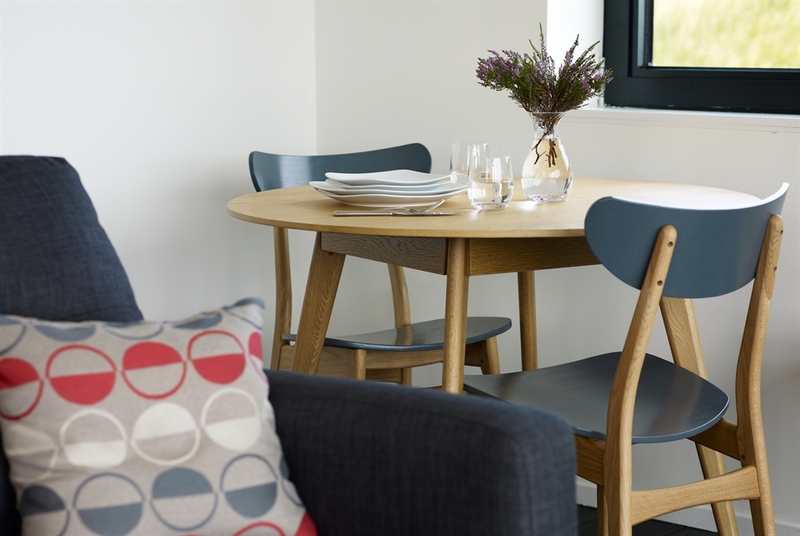 Settle in by the sofa with footstool and take in the lovely views whatever the weather or sit by the dining table. Step out into the terrace to relax and unwind in the coastal scenes. Wireless Broadband, phone (usage limits applies), HD TV with blu-ray player and a Freesat. A selection of DVDs are available and a wireless music speaker. Large open wooden terrace looking across the croft to Dunvegan Loch and the Western Isles. Enjoy the warmer days out here with a cup of tea or glass of wine and relax. Galtrigill, a small and friendly crofting township, situated at the end of a quiet single track road on a peninsula beside Loch Dunvegan. Surrounded by moorland and the sea there are stunning views to the coral beach, the Outer Hebrides, the Cuillin mountain range and MacLeod Tables. 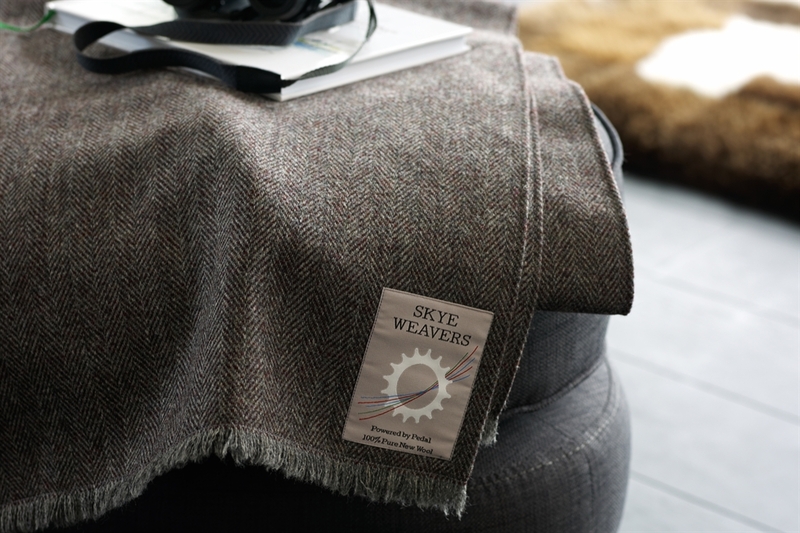 It is an ideal base to explore the North of Skye or to just relax, unwind and refresh. The Three Chimneys Restaurant is close by (4 miles) and The Red Roof Cafe (3 miles). 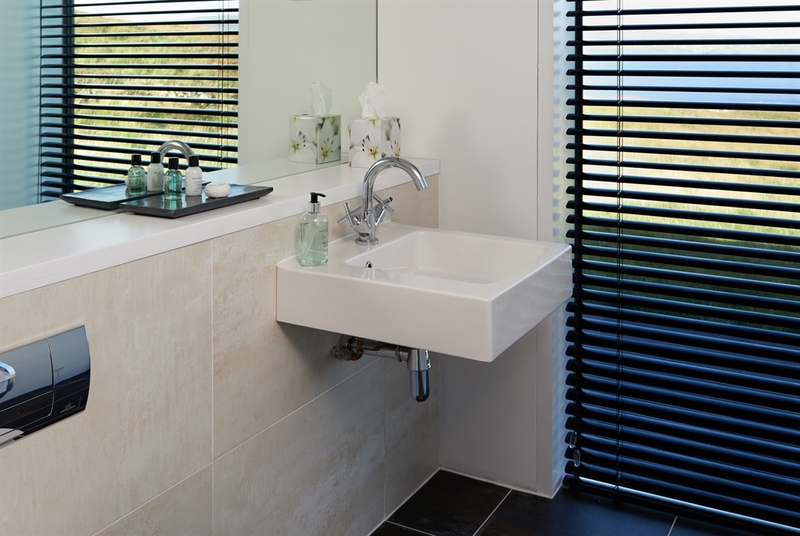 There is a local store at Glendale (2 miles) and Dunvegan (8 miles) has a range of facilities.